Our deep mean-shift prior learns complex structures with different curvatures. Other priors prefer simpler structures like lines with small curvature or sharp corners. 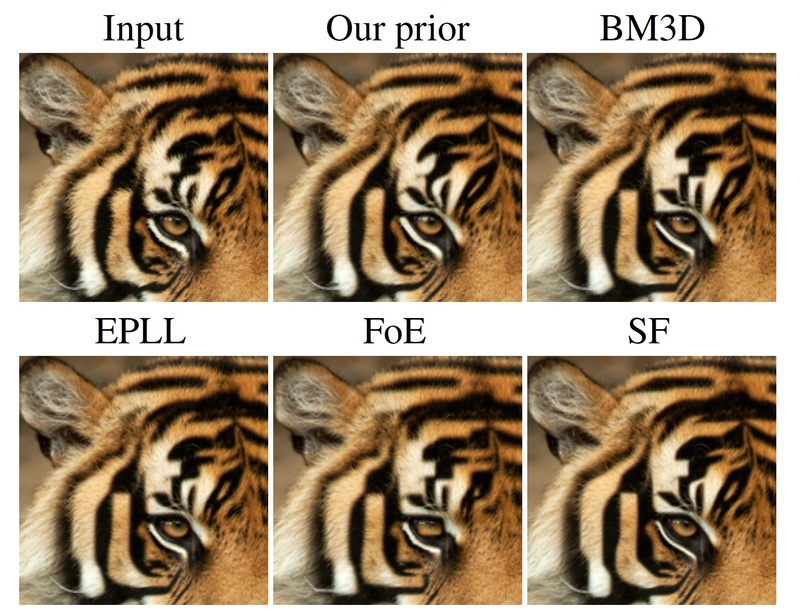 Visualization of image priors using the method by Shaham et al. (ECCV2016). In this paper we introduce a natural image prior that directly represents a Gaussian-smoothed version of the natural image distribution. We include our prior in a formulation of image restoration as a Bayes estimator that also allows us to solve noise-blind image restoration problems. We show that the gradient of our prior corresponds to the mean-shift vector on the natural image distribution. In addition, we learn the mean-shift vector field using denoising autoencoders, and use it in a gradient descent approach to perform Bayes risk minimization. We demonstrate competitive results for noise-blind deblurring, super-resolution, and demosaicing.